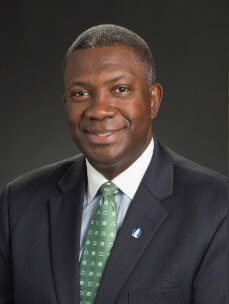 Terrance Williams, named Nationwide’s Executive Vice President and President of Emerging Businesses in April 2015, has a long history with Nationwide – and a deep passion for insurance and financial services. His career has touched almost every segment of the Property & Casualty business since he began with the company in 1995, including underwriting, claims, sales, and operations roles, taking him on a journey that spanned multiple cities across the U.S. This wide range of experience has enabled him to see all aspects of the industry holistically. Known as a purpose-driven leader, Williams saw the opportunity to guide Nationwide Marketing as an important responsibility that allowed him to live his belief that insurance and financial services serve a noble purpose. He believes that the essence of his responsibilities is to advocate and show the work the industry does as lofty and meaningful. Not only to protect and restore lives, but also to help America’s workers prepare for and live in retirement. These specific Marketing responsibilities include leading and overseeing a multitude of departments: brand, digital and social media, sports sponsorships, cause and multicultural marketing, advertising, media planning and buying, customer insights and analytics, customer advocacy, and public relations and communications. His early interest and passion for the industry is reflected in his earning a Bachelor of Science degree in Insurance at the University of South Carolina – followed by a Masters of Business Administration degree at Walden University. Over the years, he’s been active in a variety of local and national organizations, including volunteer board commitments – currently the board of directors for the Ad Council and the Columbus (Ohio) Regional Airport Authority. A Southerner at heart, Terrance was born and raised in the Lowcountry of South Carolina. He enjoys traveling, reading and is an avid classic car enthusiast. Additionally, on the weekends you can usually find him at his sons’ various sporting events. He, his wife Carla, and sons, Trey and Cameron, currently reside in the Central Ohio area.